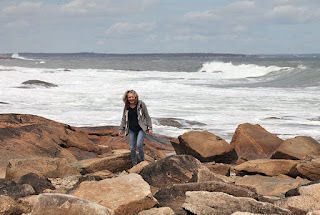 Weekend Wanderings and new Stitchery Club! This weekend was a bust, way too hot and with the holiday, way too many people to enjoy going to the ocean. Even going for a ride was tough, the one time out we ran into a parade, so we stayed in and got things done around the yard. I needed a project to work on since I prefer to sit inside with the air on, so I made up a piece with my new pattern. The pattern is available now and this shows you that you can use it in different ways to make matching pieces. I wanted something to put on a small wall area and this fit just right. I changed the pattern to fit a stitchery and added a few extra items. The fireworks was something I added after I made the pattern and decided to keep it out, on the punch it didn't look right to me. On the stitchery it was a nice way to fill in some space and use it as a bit of quilting. I took the photo outside so it turned back to light, it actually was walnut stained but it doesn't show up in the photo. I added a touch of color with my art pens and I think it turned out nicely and a fun piece to hang for summer. The finished piece is 9 1/2" x 9". In other news, the new baby has arrived. My son got phone photos and sent them to me, so I was happy to see my new grandson. I sure wish they weren't staying in Malaysia so long, I do miss my sweet Nick and would love to spend the summer having fun with him. I am sure I will become just as, in love with Alex once I hold him in my arms but I have to admit, I am in love and wish I could just pick him up and cuddle him. I hope everyone had a wonderful weekend. The heat is ending today so I am going to enjoy the cooler temps this week. 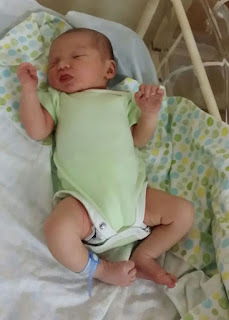 Alex St. Germain: No idea what his middle name is, what day he was born or the weight, but he does look bigger than Nick at birth. This week I was inspired by the holiday and the upcoming Fourth of July. 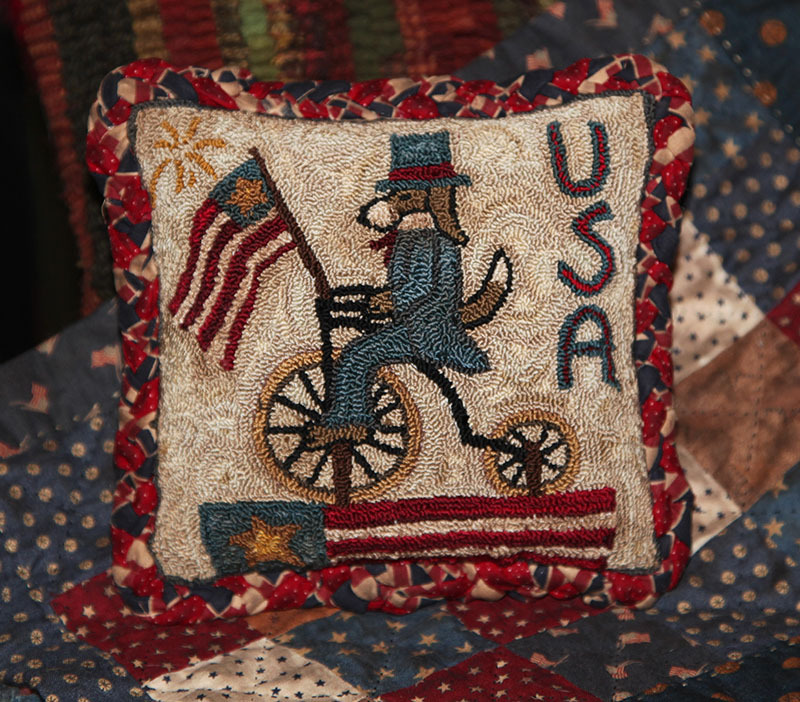 I wanted to make something patriotic and saw an antique piece that I just had to recreate. Well, I drew out the original idea and then decided I wanted something different from the typical Uncle Sam's and that is how Uncle Dawg came about. It is a fun piece and I hope you like it, as well. I have started the directions with color chart and still need to redo the design but I am hoping I can get it done this weekend and have the pattern ready in a few days. On this piece I made a braided edge since I wanted a larger pillow to display on the table. I think this would be fun to do in a hooked rug. I hope everyone has a wonderful weekend, we are working on the yard and Bill is making a space for my new blow up pool. I love to swim and didn't want to buy a pool right now, so trying a blow up and hoping it won't pop, lol. 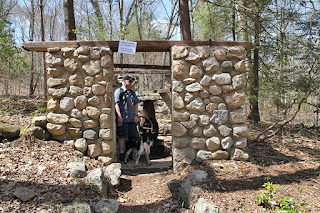 Another beautiful weekend and the last before the beaches open and the crowds come, so we enjoyed a few days hiking and exploring. 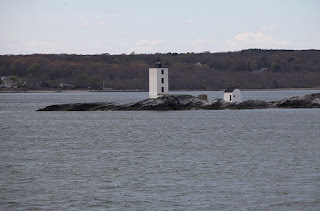 On Saturday I decided I wanted to go to Bluff Point in Connecticut. It is a wonderful park with nice trails that go out to the ocean and not only do they have restrooms, they have one at the end of the trail, as well. There was quite a few people but spread out enough that we could enjoy walking by ourselves, most of the time. Bean was being good, he is calming down enough that he doesn't lunge for every person that passes by, but he does take the lead and it is a hard pace to keep up with. 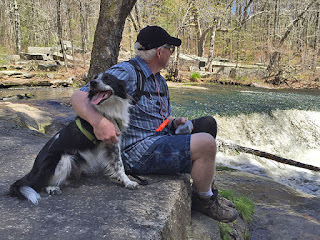 I am trying a new trick, letting Bill take the lead and making Bean stay behind him, so hopefully he will get the hang of walking calmly beside us on public trails. We took my son which was a good thing, his eyes are better than mine and with Bean pulling, I miss things. 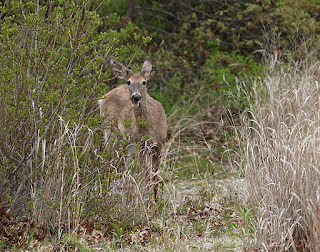 The first thing we spotted was a fawn, who didn't seem phased by the people walking by. Further down the trail my son spotted a bird. 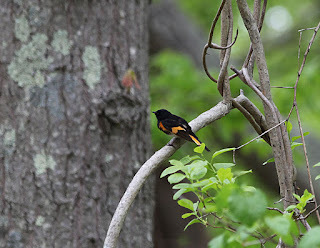 I am not good with bird identification, but he was pretty. 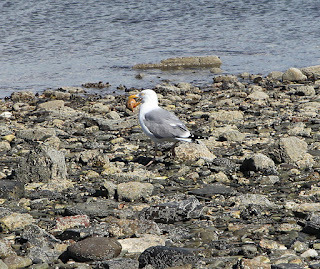 The disappointment was, it is nesting season so no dogs allowed on the beaches. They have a long stretch of beach and Bean really wanted to go play in the water, but he had to stay on the trails. 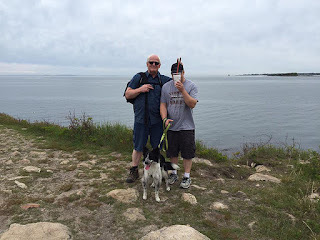 The trail ends at the point with a view of Connecticut to the left, Rhode Island beyond that and New York across the water and of course a view of the guys being goofy. 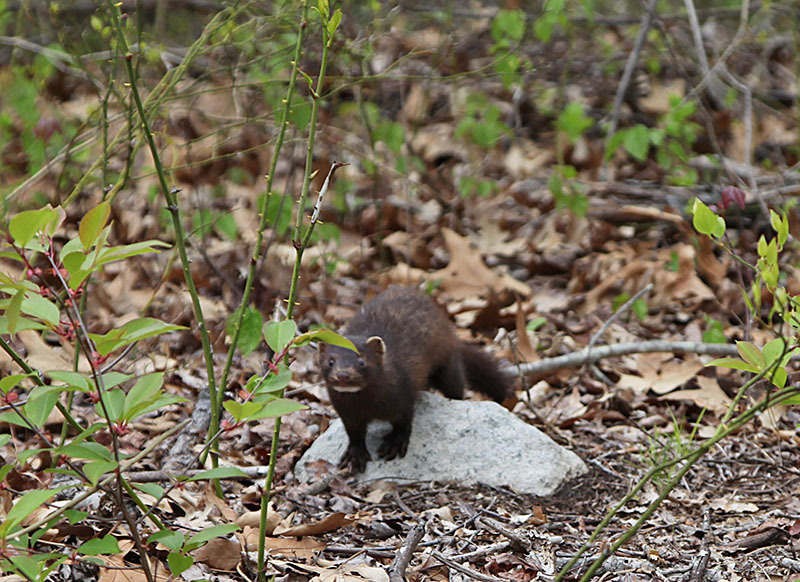 We came back along the inner trail, a quieter path and we spotted this guy who seemed like he was lost. 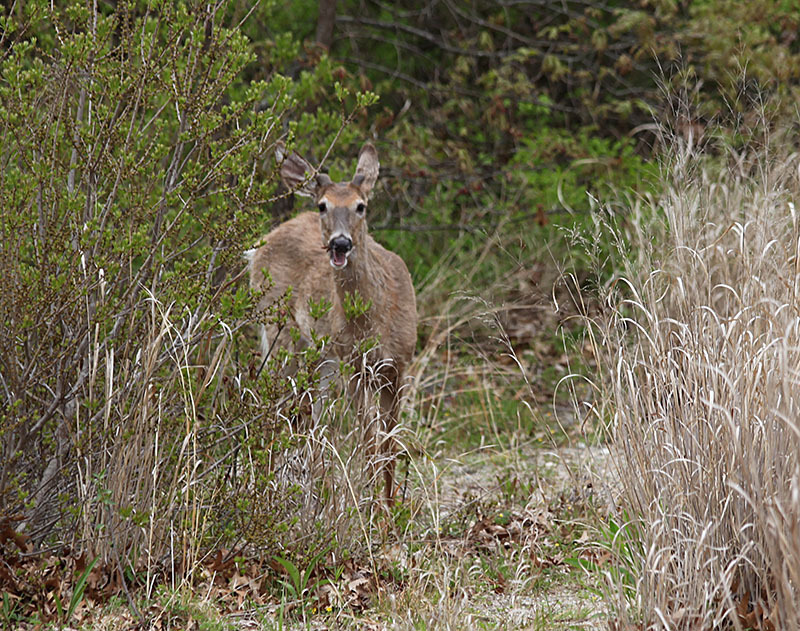 He started to come to me, then got scared and ran. My husband said a guy who he worked with, told him that he released his ferrets in the park, so I am thinking, this may be one. This photo makes him look scary but he was very calm, just seemed scared. Sunday was a cloudy day with chance of rain but we only got a brief shower and were able to enjoy some time at Black Point. 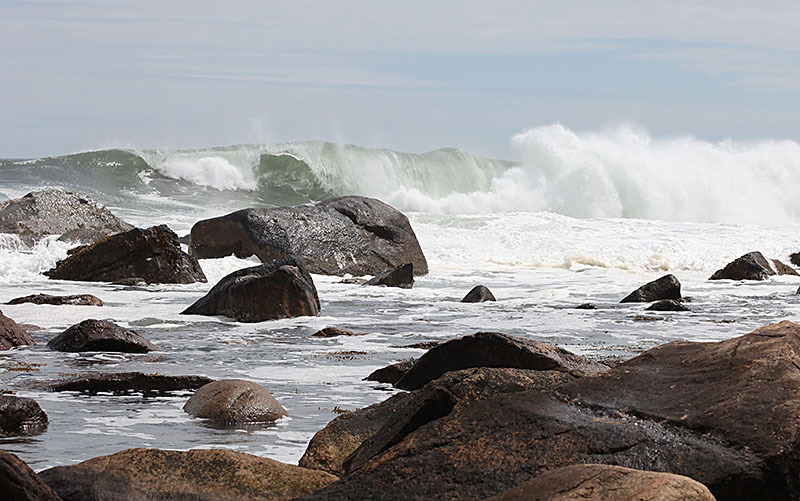 The tide was going out and the waves were coming in. I was hunting for heart rocks and Bill decided to take photos of me, so I decided to make faces at him, this is something between goofy and laughing. I hope you all had a wonderful weekend. I was thinking of my sister when I made these. She loves snow men and always asks me to make more that she can buy for next year, so I let her go through my snowmen pieces and pick what she wants. 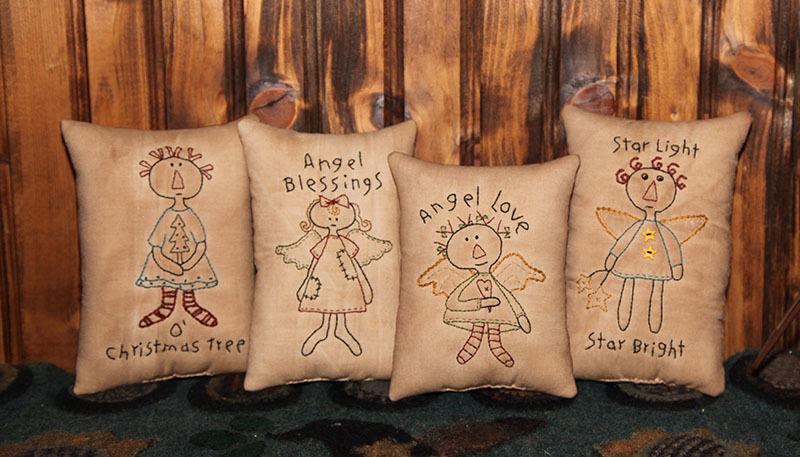 The first is a pillow, something simple but fun to do. I added a saying and a carrot button, as well as, the wool heart. I enjoy putting little touches on each piece, though I think the nose is a bit big for this guy. I use Faber Castell art pens to color with, they are archival inks, waterproof and have a longer tip so they color in nicely without bleeding. I wet the pieces to remove the washable ink and then use walnut stain on them and the ink does not run. The second I made as a pair, but only got one finished and this way I can see how it looks before I dod the other one. 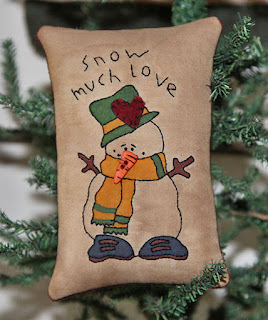 I do like how it came out and a fun way to finish a stitchery to be used as an ornament. I did the stitchery with the batting on, then added a backing and did the stitching first, then I cut around the stitching with pinking shears. I had fun adding star buttons to this one. I also added a snowflake to the back so it would look nice if the ornament spins around on the tree. I hope everyone has a nice weekend. We have a nice day tomorrow so hoping to get out for some hiking. 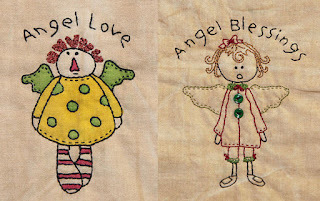 This weekend I made up some new angels to do and finished the second one today, but I still have to make them into pieces. 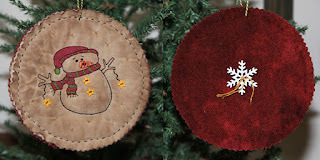 They are both from the North Pole Christmas Craft pages. I think they will keep me busy all year. 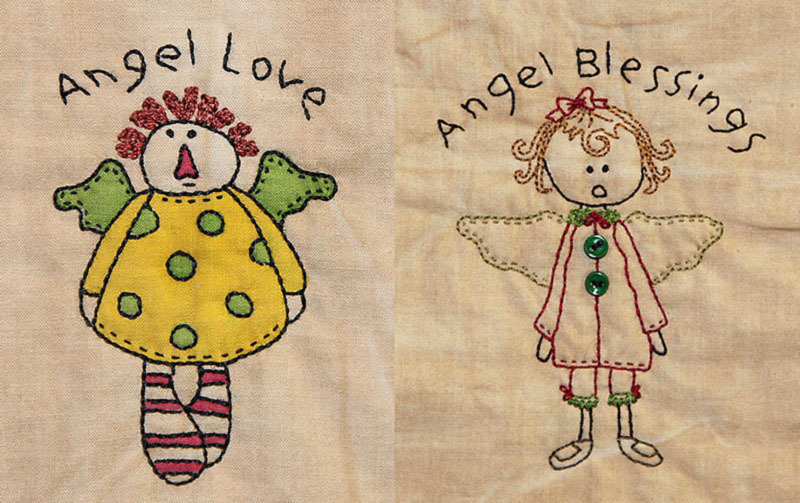 I wanted to try some fun and bright angels, one is stitched and the other I colored in with Faber Castell artist pens, then stitched around that. On Saturday I wanted to go for a walk but not drive too far, so we went to Rome Point which is down the road. 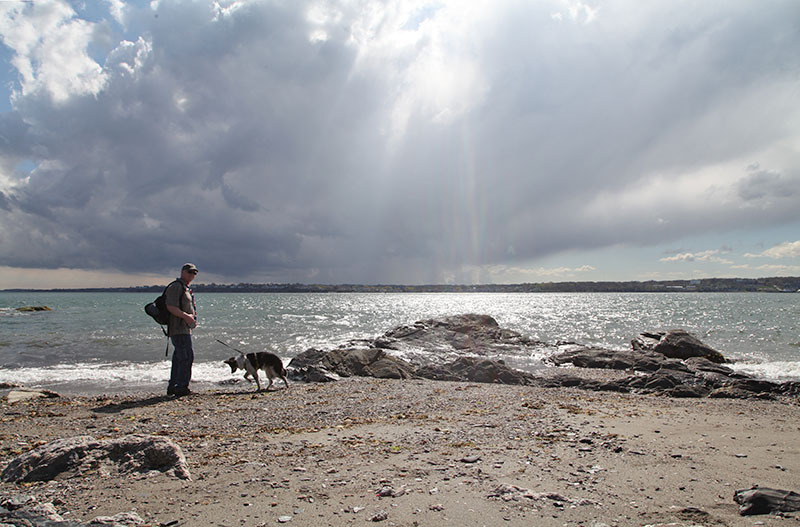 I love to walk there, it starts on an old road, goes through the woods along trails and comes out to a long beach. Once we walk down that beach, we head back up and then go down the other side to the point, then back through another path through the woods. 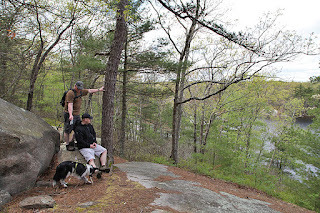 It is a good hike but enjoyable and easy going since we stop and enjoy the views. We were lucky since no one was on that side and we could let Bean run loose and he loved it. He stayed with us, so it is a good place to train him to stay with us and come when called. I didn't realize that I had pulled the sharpness filter too far, so I reversed it by blurring a bit, so hopefully the photo looks alright and not too bright. 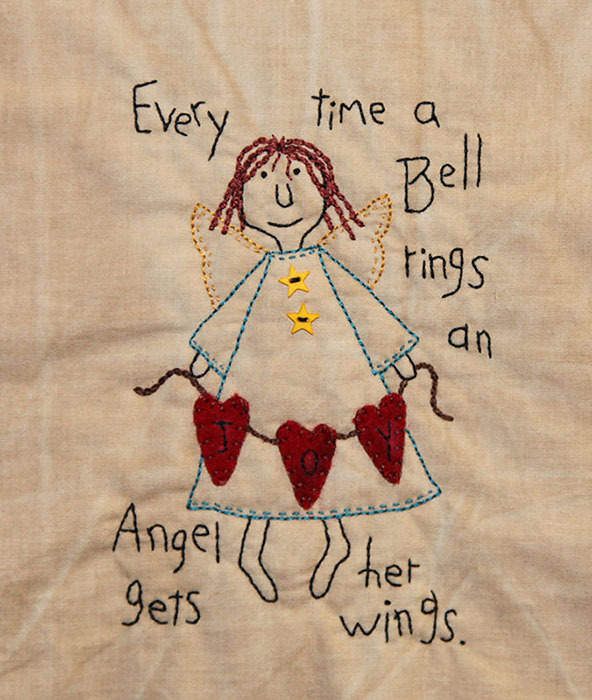 The colored angel was bright but once the ink dried, it faded in and the black threads really made it pop without being bright. 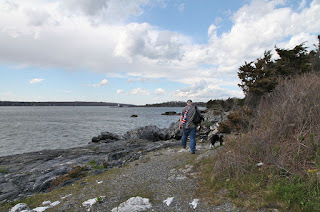 On Sunday we had another nice day but the wind was gusting, so we decided on an inland hike. We went to the boy scout camp which has paths, that go around the pond, so we took the easier routes since I didn't want to over do it. We still did a bit of climbing but I had Bean going full gear and pulling me up the hills. We went half way around the pond and headed back and went up a couple of other paths that led to another pond, on the other side. I was surprised at how many camps there were in each area and the last one led to a spot where you could go out and enjoy the views from the rocks. Tonight I could not get the photo window to open up and I know a few of you have had that problem with blogger. I have my photos on the desktop and just picked it up and dropped it on the page and it took, so that is an option if you want to use photos, not sure if you can drag and drop on windows, I am on a mac. This week I was browsing for new design ideas and stumbled onto a site that I hadn't been to in years. 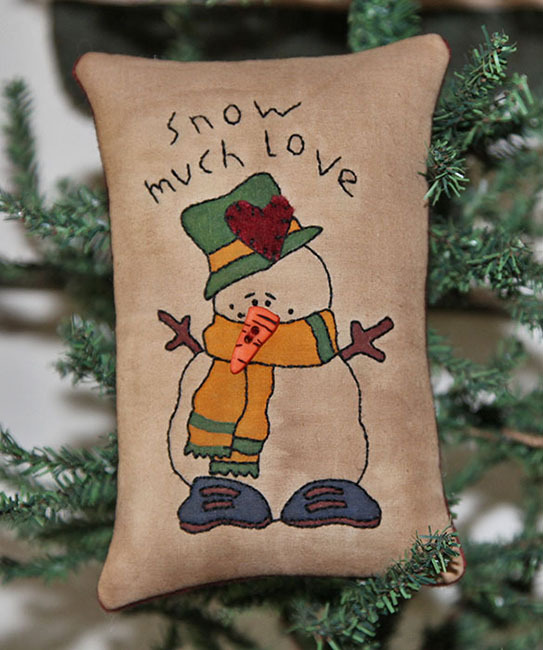 It is called North Pole Christmas and they have a lot more patterns and crafts than they used to and a great place for designs that you can use in any medium, as well as crafts and cards that you can print out. 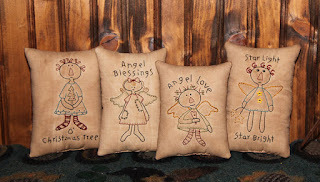 I wanted to do angels so I picked some angel designs that I liked and tried them in stitchery. These were fun to do and I added sayings to go with them. I think they would be nice with rusty bells attached too. I also want to do brighter ones so I will be trying something else with some new ones I found, we shall see how they turn out. I like to make things I can give away and I think it would be nice to have some fun ones for people who prefer that, and a nice idea for nursing home patients to have something they could hang in their room. I can see doing these in appliqué mixed with stitchery and punch needle, as well. I hope everyone has a nice weekend. 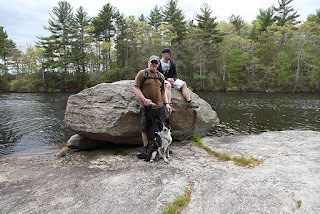 We have nice weather with a mix of rain so hopefully we can get out for some new adventures this weekend. The rain finally stopped and we were able to get out Sunday and go for a nice walk. 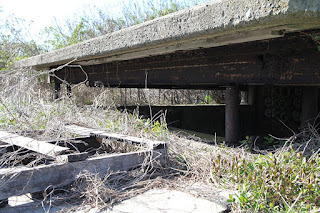 We were heading to the lighthouse but I decided to go to Fort Getty which was an old fort in World War II and now it is a park and camping area. Usually we just go in and drive around and enjoy the views but this time we parked at the entrance and found a wonderful path that went along the cliffs on one side and a bird sanctuary on the other. We went down to the beach area first and I found this little hidden entrance to the other side. 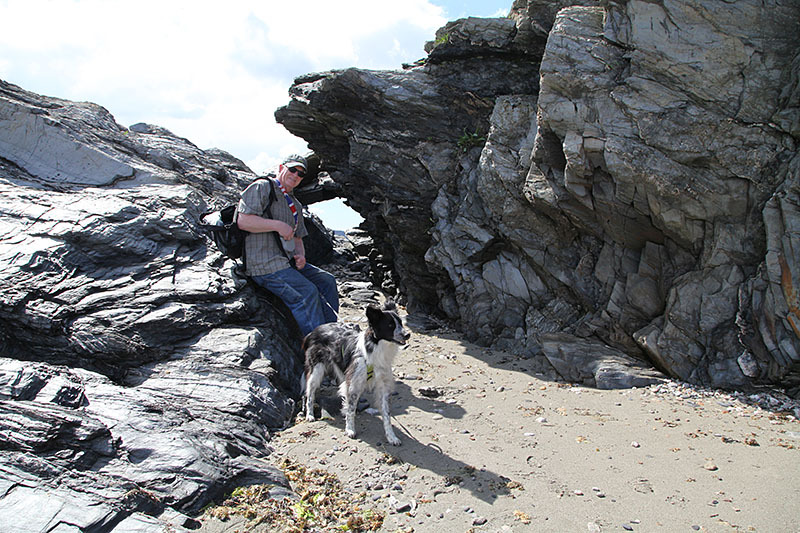 On the other side was another small beach, surrounded by the cliffs and a nice place to enjoy the views and let Bean play. There was a huge dark cloud coming our way and the sun was beaming through, one of those moments that seems awe inspiring. We headed back up and walked along the cliffs, but it got a bit narrow and I have no desire to fall down a cliff, so we found a path that took us above the cliffs. The walk goes around to the campground and docks. You can launch boats here, a future paddle for us someday. 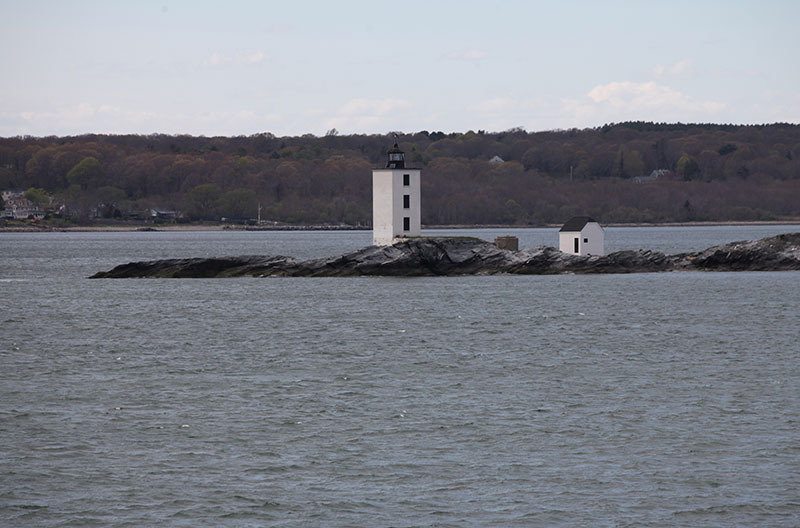 The lighthouse is on Dutch Island. It is a park now and you can paddle over and camp there, but when we were young, we had a boat and would spend the day on the island and have a picnic on the beach. 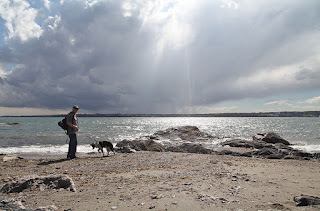 We were able to walk along the beaches on the other side and Bean played with some labs who were going for a swim. 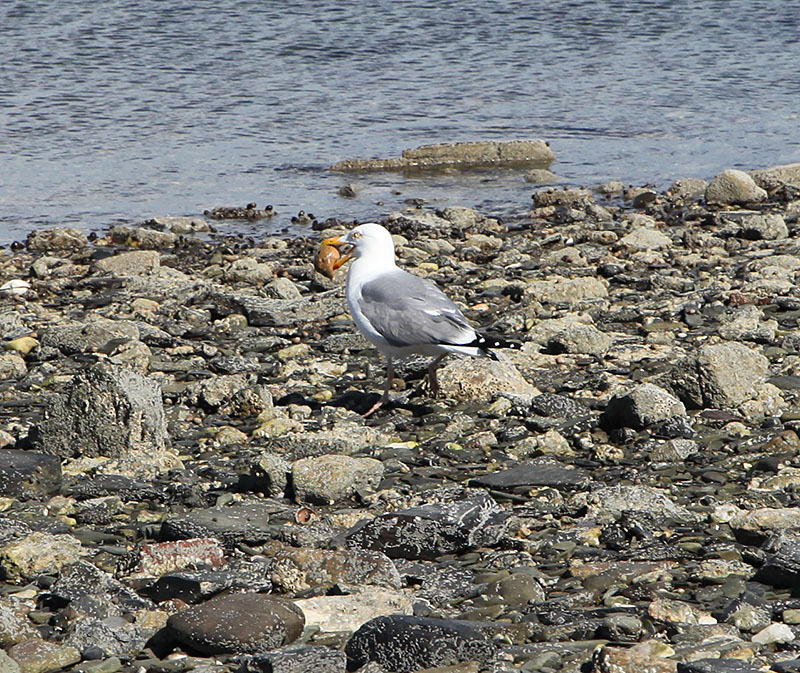 On the opposite side is the bird sanctuary, I spied this guy feasting on a clam. Coming back we went back up the hill through the campground, which is closed now. At the top of the hill are where the forts once stood, now you can see remnants of what is left and most have been caved in and covered to keep people from getting hurt in them. 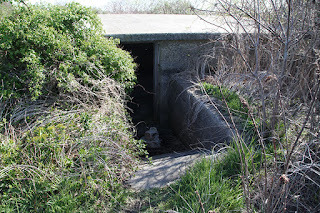 This is the entrance to once bunker, a bit too creepy and dirty for me to go inside. The men would keep watch in here through the slits on the other side. In those days they were afraid the enemy would come up the bay and attack. During the war, the island was flat so there were no trees in the way. And my special gift for mother's day was a heart rock. 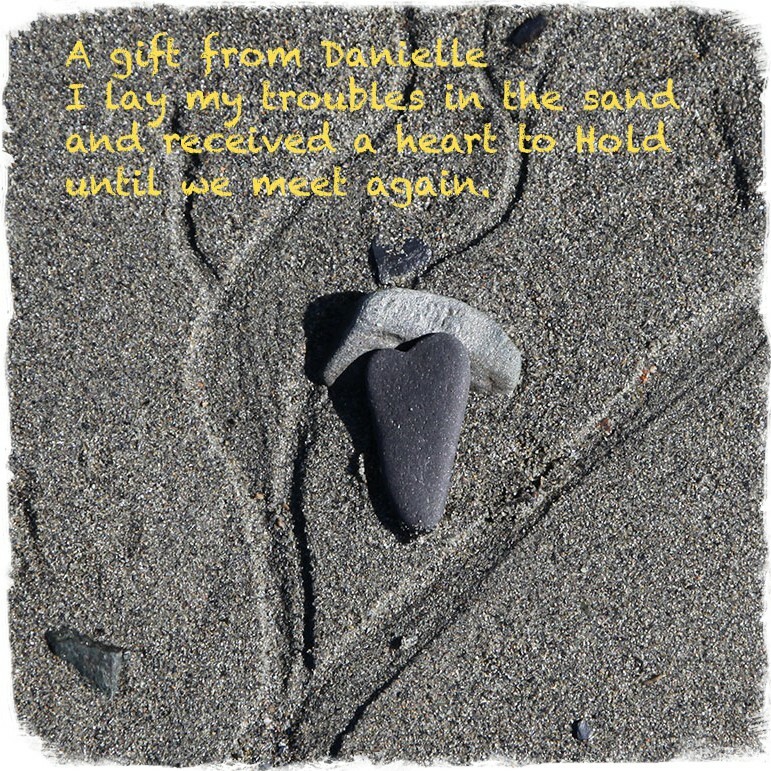 Bill was searching all over the rocks for a heart rock and I said, don't look, the right rock will be there when you see it and there on the sand was a heart rock for me. It was the perfect way to spend the day and know that Danielle was with me in spirit. I hope everyone had a wonderful day. This has been a rainy week so it was a good week to work on some new projects. The first one is a free design by Cheryl Seslar. I have had the pattern for years, so not sure where I got the free one. I wanted to have fun with this one so I used more color. I will make it into a mini quilt and it will go into my gift box. The second piece I made is from another design I found on the internet. I am not sure who the designer is and the site is in another language, so I hope it was free. 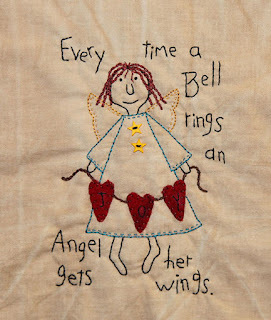 I just loved this one, love the saying and the cute angel, just brings a smile to my face and hopefully the person who I decide to give it to. The photos are not the best, so hopefully I can get some nicer ones when I finish them. 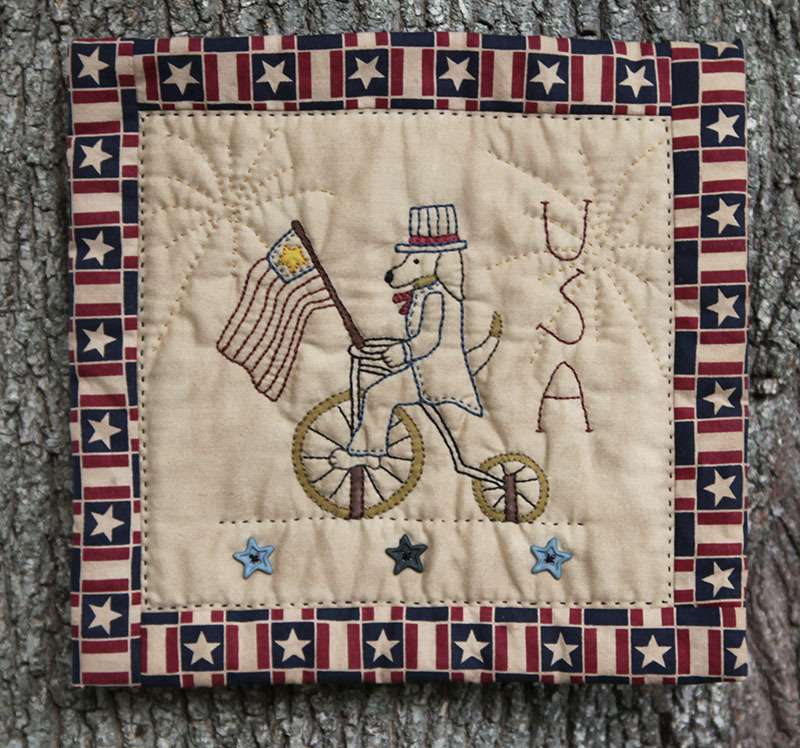 I added a few fun touches on this one, the hair is done with a chain stitch and the stars are an addition. 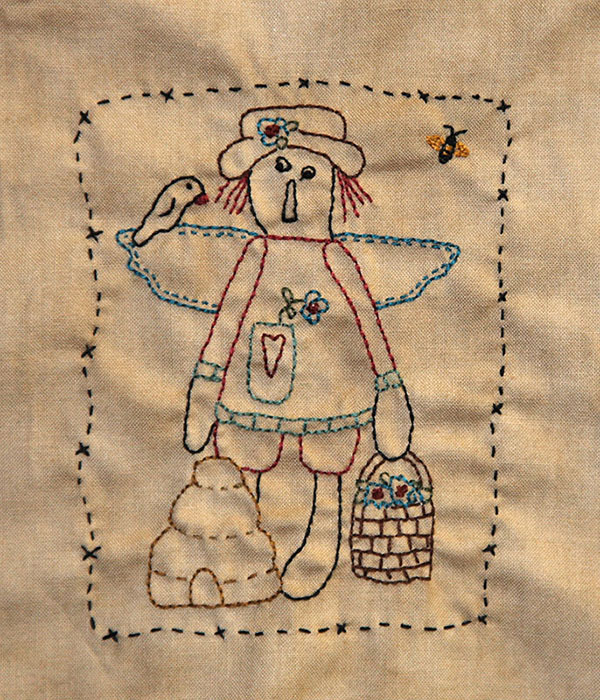 I also used batting on this one, that way I get more depth in the piece, the raggedy ann is done just on the cloth and a looser weave, I think I prefer the muslin for stitchery. I hope everyone has a nice weekend. We have rain on and off so hopefully we will get some breaks and out for a few walks. 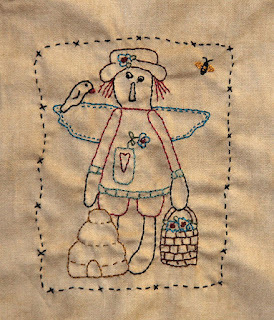 I wanted to share a new stitchery club being offered by Kathy Schmitz, called One Stitch at a Time. I received her email and you can read about it on her blog. 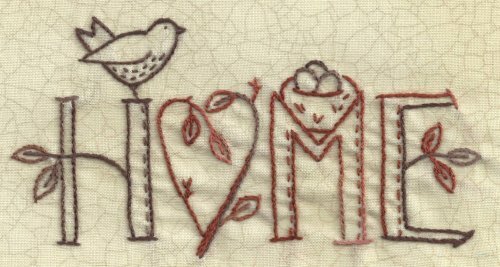 For only 2.00 a month, you will receive a new monthly stitchery, in epattern form. They are smaller ones, which makes them quick and fun and a great way to get started on your gift box. I think this is well worth the money and something fun to look forward to every month. Here is the first one she is offering, starting in June. 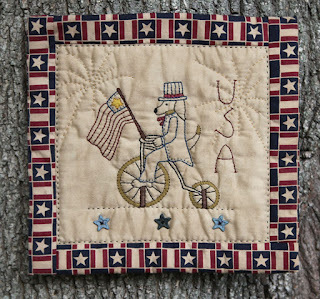 I can't wait to get mine, it will be the perfect project to make a few of, for gifts, when we go camping. Saturday we were lucky enough to have perfect weather for hiking. 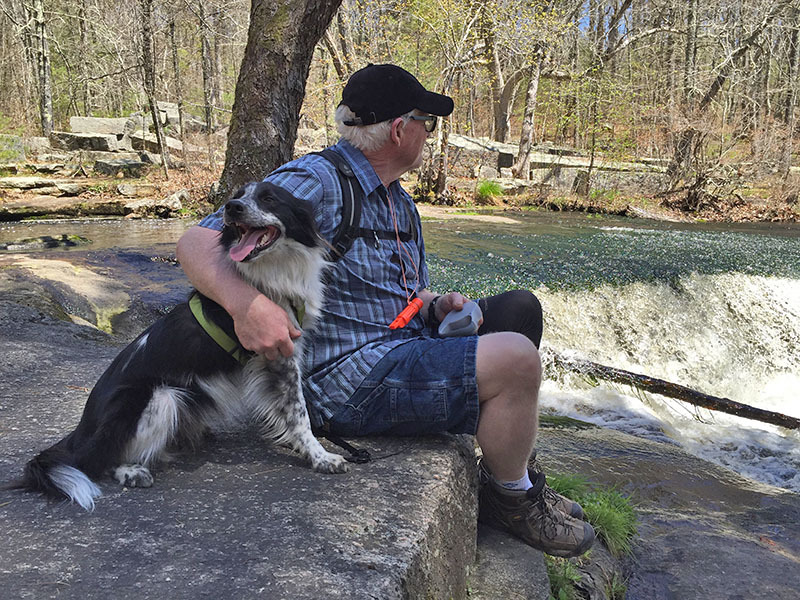 Warm sun with a light breeze, so we headed to Stepping Stone Falls. This was a place that I went when I was young and we had picnics in the spring and fall, so it is one of those places that just lifts my spirit when we go there. How can you not relax and just enjoy the moment, with a front row seat to the falls. Of course Bean was more interested in the people walking by. 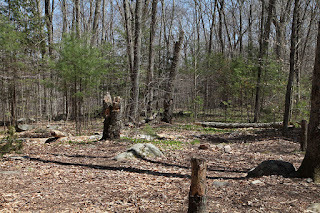 There were a lot of trees down from the wind storms over the winter. Bill wanted me to get a picture of him under the tree, Bean wanted to go so he could meet more people. 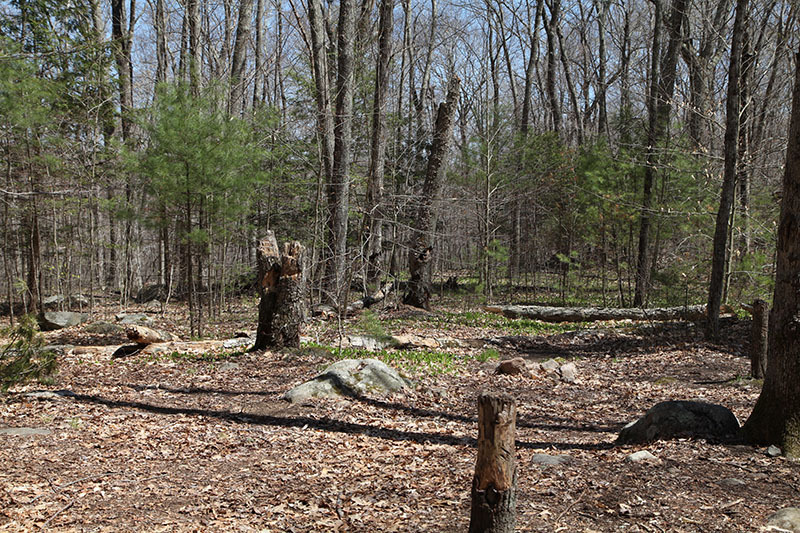 On the way back we came up to where the old picnic area was. 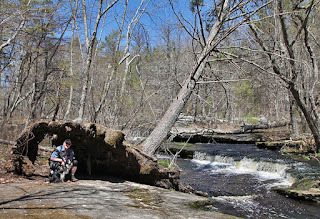 It used to be all cleared out and picnic tables and there is a path through the stone wall that took us to the falls. I don't know why they closed it, but they are cleaning it up now. 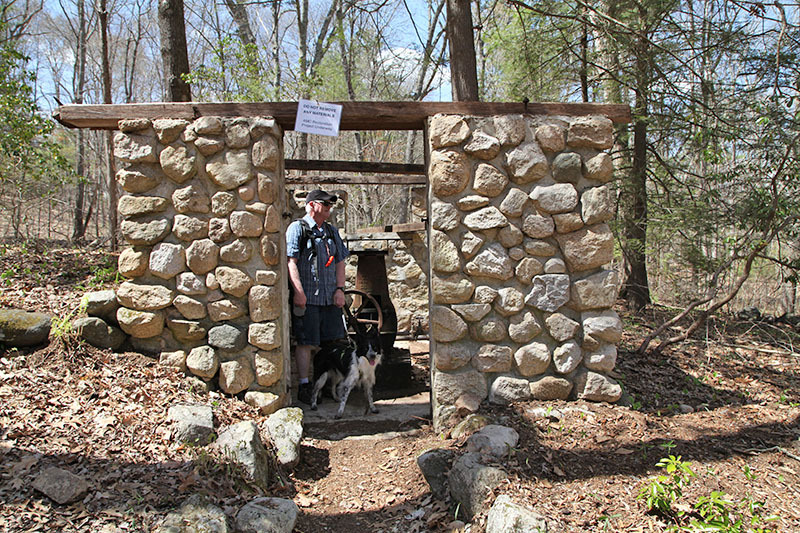 We stumbled on an old pump house, the sign said that the AMC is restoring it and fixing the old shelters, so that will be nice. It was nice to get out before the rains came.